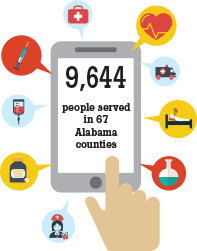 United Way Community Impact – United Way of Central Alabama, Inc.
Everyone deserves opportunities to have a good life: a quality education that leads to a stable job, enough income to support a family through retirement, and good health. Together, we can make an impact on our neighbors’ lives. We focus on cradle-to-career education strategies that provide a firm foundation at an early age and continue to develop our children into successful adults who can contribute to their communities. Working families continue to face economic challenges. United Way has achieved measurable success putting individuals and families on the road to financial stability. Long-term economic success for all is not possible without an investment in long-term human success. Healthy eating and physical activity are essential to good health. United Way works to remove barriers to eating healthy and staying active, to create healthier individuals and thriving communities. No one should be denied basic services because they don’t have a link to the right services. We connect people to an extensive network of vital emergency services to help individuals and families get back on their feet.